It is hard to believe that after half a century of social, scientific, and medical progress, these words by Whitney Young are as telling today as they were in 1963 when he spoke at the March on Washington for Jobs and Freedom. Today, as in the early 1960s, black infants are more than twice as likely as white infants to die within their first year of life. Infant mortality has long been considered to be an important indicator of a nation’s health, and while it has fallen dramatically over the past five decades, there are still stark differences along socioeconomic, geographic, and especially racial lines. In 2009, the infant mortality rate was 12.4 infant deaths per 1,000 live births among blacks, compared to 5.3 among whites. Equally large and persistent differences by race are found for other birth outcomes – including stillbirths, preterm births, and low birth weight – and many of these contribute to the racial gap in infant mortality. Many factors are known to affect birth outcomes – these include the mother’s age, education, health status, and behavior during pregnancy. But study after study show that these factors fail to explain large differences by race. Highly educated white women who wait until their 20s and 30s to have a child have much better birth outcomes than highly educated black women of the same age. In fact, black mothers with college and even advanced degrees have a higher infant mortality rate than white mothers who have not finished high school. Nor do genetics explain the difference. The birth weights of babies born in the US to African-born mothers are similar to those of babies born to white American mothers – and both are significantly higher than those born to black American women. Researchers and others are still trying to solve this complex and worrying puzzle. They are expanding their inquiries by looking at women’s experiences across the course of their lives – including health early in life, in utero, and even in the prior generation – in an effort to understand what’s going on. They are also looking beyond individual level factors, to family and community conditions such as father involvement, reproductive social capital (how connected a pregnant woman feels to her to community), and community supports. Finally, researchers are also looking more closely at how broader social and economic conditions, including racism, stress, and material hardship, shape the experiences and health of black women and their families. The evidence on the biology of disadvantage – how social and economic conditions affect our health and survival – is rapidly building and points to the need for radically different approaches to closing the black-white gap in birth outcomes. Fifty years after the March on Washington, it is clear that we still have a long way to go before the life chances of a black newborn resemble those of a white newborn. We need to heed Whitney Young’s call to action now more than ever. 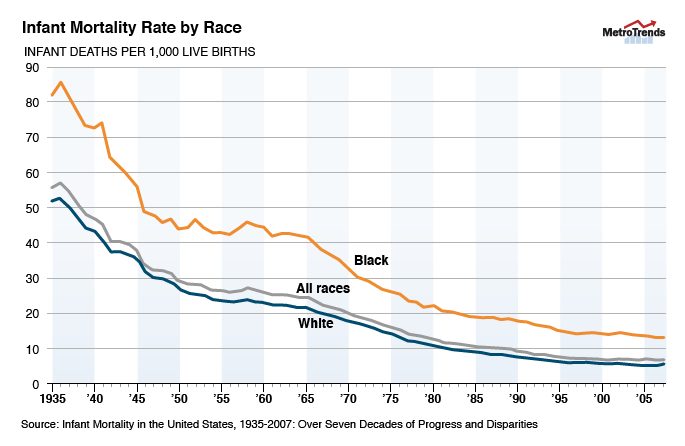 Graphic from Figure 2 of "From Figure 2 of Infant Mortality in the United States, 1937-2007: Over Seven Decades of Progress and Disparities"
The word “despite” in the title of this article suggests that reductions in infant mortality would be expected to reduce racial differences in infant mortality. In fact, as with reducing any adverse outcome, reductions in infant mortality, while tending to reduce relative differences in infant survival, will tend to increase relative differences in infant mortality. Several references explaining these patterns are listed below. Reference 4 and 6 specifically discuss reference 1 the HRSA study referenced in this article. It is an example of a situation where observers refer to disparities in mortality and disparities in survival interchangeably without recognizing that the two tend to change in opposite directions and overall mortality rates change.